The tree to the under is a Weeping Ash tree. No names in 1828-9 or 1822-3 lists. 1846 Mrs. Hannah Cundy. Private Resident. 1849 Mrs. Hannah Cundy. Private Resident. 1852 Mrs. Hannah Cundy. Private Resident. 1857 Mrs. Hannah Cundy. Private Resident. 1860 Mrs. Hannah Cundy. Private Resident. 1861 Mrs. Hannah Cundy. Private Resident. 1862 Mrs. Hannah Cundy. Private Resident. There does not seem to be any famous Cundy's in Chesterfield at this time but there is a Cundy Road in Bolsover. Mr Gothard must have left or died about this time as some mention one gent and others the other. 1895 Christopher Thorpe. Private Resident. Also he was FSI, (Was abbreviated} Land Agent and Surveyor. 1912 Julius Verner. Private Resident. 1922 Julius Verner. Private Resident. 1925 Julius Verner. Private Resident. 1936 John Mottishaw. Poultry Farmer. 1941 John Mottishaw. Poultry Farmer. John Mottishaw and his family lived here without electric and fetched the water from the stream below the bridge. There are two quite separate houses here, one is a stone built farm house possibly 17th century at the top nearest to Calow church and the other is a later, large and imposing, possibly Victorian 'Gentlemens' house next to but lower down. This is the house you can see from a distance on the Hady side of Calow. The house may have served at one time as part of the Calow/Hady Ironworks run by the Smiths of Chesterfield until closure in 1836. I say may, because nobody is quite sure exactly if Calow and Hady were two separate works and if they were the site of Hady Ironworks is known but not that of Calow. Large out of the way houses like yours had many uses over the years changing with the political and economic environment and one as old as yours appears to be have served many purposes during their life. The roadway or Dingle Lane is not as I am aware an old Toll Road. 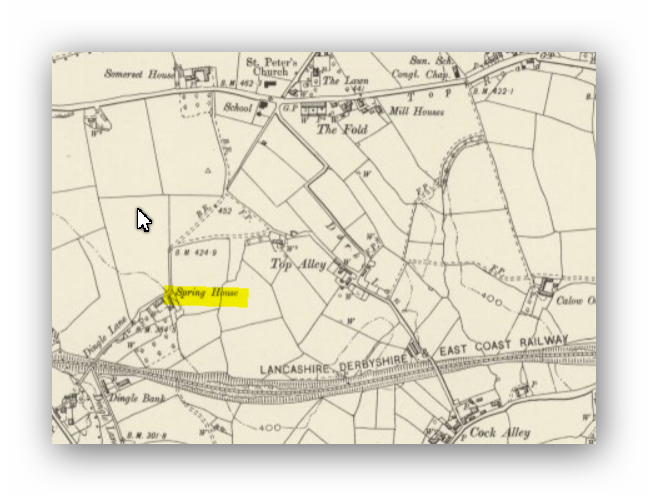 On saying that the Smiths Adelphi Ironworks had Toll Cottages at the top of the ironworks road at the rear of the Duckmanton Lodge on Works Lane. I have noticed from 19th Century O.S. Maps that the road ended at the house and up to Calow was serviced only by footpaths. An entry in the Bulmers Directory for 1895 shows a James Gothard with the title of Gentleman living at Spring House. In 1861 Mrs.Hannah Cundy lived there. This possibly explains why there is only one road in. The house was for a wealthy family, they needed transport and the house was designed to accommodate these horse drawn carriages for their use. 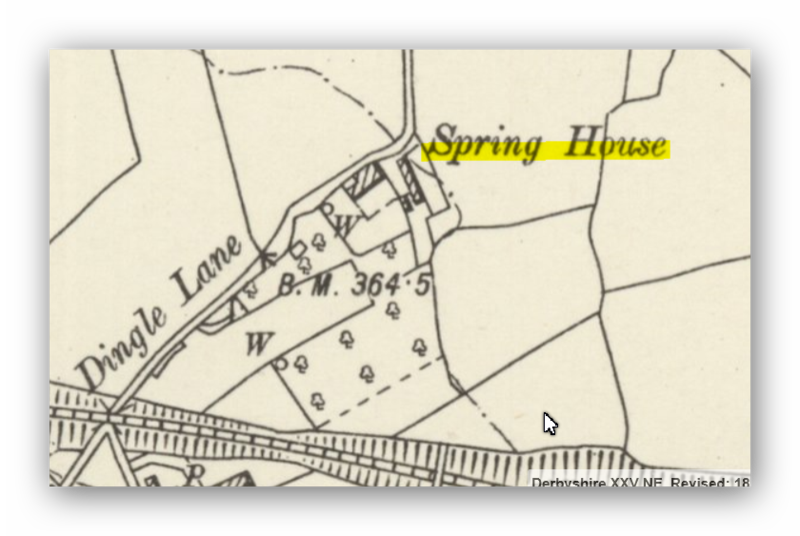 There are several wells in this area hence Spring House. A Dingle is land on which Ducks were kept. I would like to suggest that the house was built originally as a house or even a small farm for a wealthy small landowner but not necessarily rich family or landed gentry and may have been used as a residence for the works manager of the Calow Ironworks as the Hady Ironworks were at Brocksops farm and the Iron Master Mr. Smith lived at Brampton. It was later the home of a Gentleman and then used as a farm as so many of the larger houses were. I remember walking past the farm gates as a child on my way too and from my Uncles on Storforth Lane Hasland and being confronted by two or more very large dogs. I used to tip-toe past with my heart in my mouth. Many thanks to Stephen Clay and his family for allowing me on to their land. Top set of Photographs. The older house. Maps OS 1897. National Library of Scotland. Bottom set of Photographs. The newer house. Taken in 2002 by and copyright. Neil.